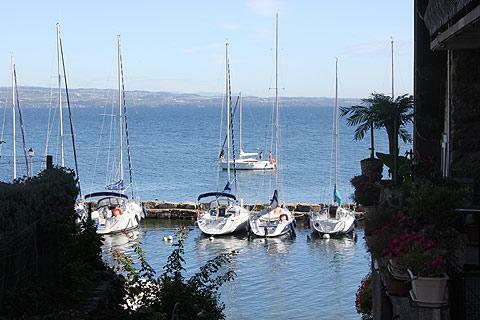 The village of Yvoire is set on a peninsula on Lake Geneva, the Leman peninsula, which divides the Lake into two parts: the 'small lake' and the 'large lake'. Because of its strategic position between the 'small lake' and 'large lake' the village was fortified in the early 14th century and for 500 years or so it had an important military role in the region. When times became calmer Yvoire reverted to a village dependant on farming and fishing but luckily kept the key features of its important past. The stone doors through the ramparts and the chateau are existing remnants of this more turbulent time. France This Way comment: the pretty village, the church and castle, and the lakeside position all combine to make Yvoire one of our favourite villages in this region. Yvoire is a town overflowing with medieval architecture, artisans and cafes, and above all, lovely views out across the Lake. 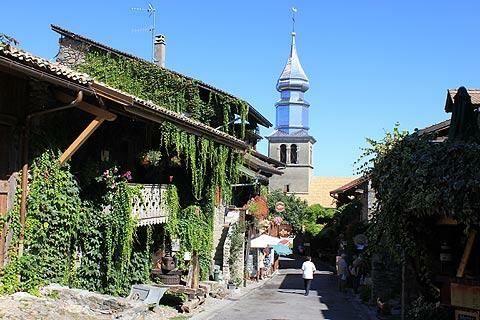 It is listed as one of the 'most beautiful villages of France' and definitely deserves the classification. 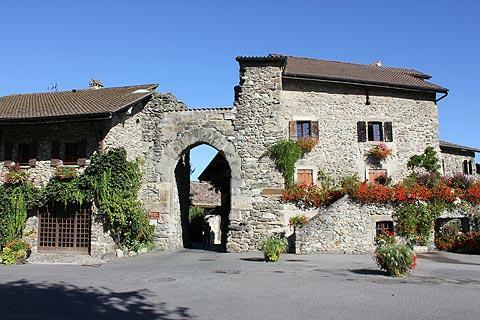 Its streets are full of medieval buildings - alpine style - with stone walls, steep roofs, wooden balconies and shutters and from all around the village there are views of the castle and the church steeple. 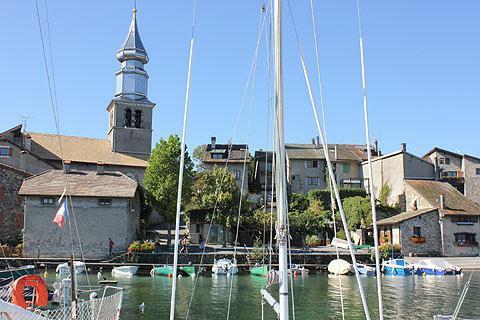 Start your visit in the Place du Thay: this is the main square in Yvoire and it is here you will find the church. The church of Saint Pancrace dates back to the 11th century but has been altered and rebuilt since then. Its steeple which is built with an onion shaped dome common to this area was built in the mid 19th century and gleams attractively above the village. It was renovated in the 1980s and is constructed of stainless steel and gold leaf. 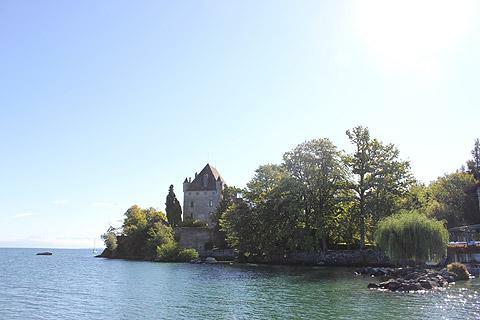 Dominating views of Yvoire is the attractive castle, with a large steep roof and little turrets at each corner that sits right on the edge of the lake. The chateau is private but a part of its garden - called the Jardin des Cinq Sens (garden of five senses) - is now open to the public. 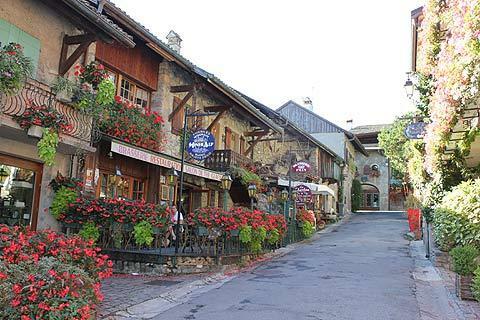 This beautiful medieval village has lots of nice boutiques and bars and restaurants making it a pleasant place to stop a bit longer to have lunch here as well. 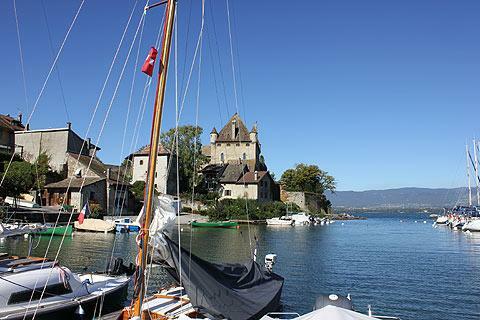 Yvoire is on the edge of the lovely Lac Leman with walks along the water's edge and small boats bobbing on the water in the small harbour. There is water on two sides of the village: on one side you can see the quaint little Port des Pecheurs, the fishing port, and on the other is the larger Port de Plaisance, the main port and a long promenade with the harbour on one side and an attractive public park on the other. 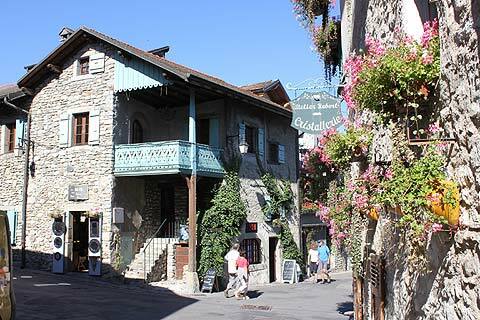 The town is made even more beautiful by the large number of flowers: they really are everywhere and the town has won numerous awards for its flower displays, and attracts many visitors as a result. In 2002 Yvoire represented France in the European contest and won the International Trophy for Landscape and Horticulture. 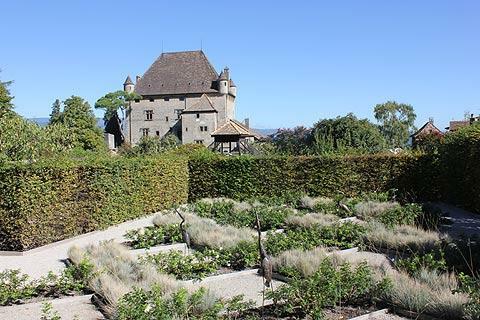 Created in the former vegetable garden of the chateau, these gardens are dedicated to the five senses and there is a garden for each sense. The gardens are split into a number of 'garden rooms' including the garden of flavours, garden of fragrance, garden of textures, garden of sight and garden of hearing. 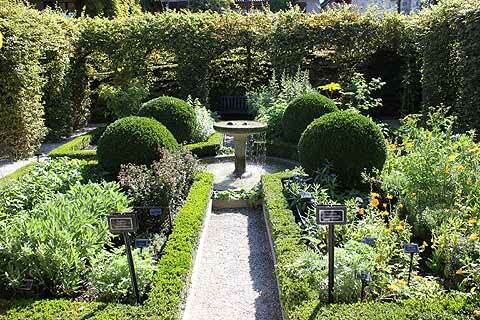 There is also a little cloister garden containing herbs and medicinal plants in the style often found in medieval times. This cloister garden was my personal favourite but the garden of fragrances was also a real pleasure. Take the time to sit down and breath in the heady fragrances. I was in Yvoire in summer and the phlox and myrrhs odorata smelt gorgeous. I'm definitely going to be buying some of these for my own garden. 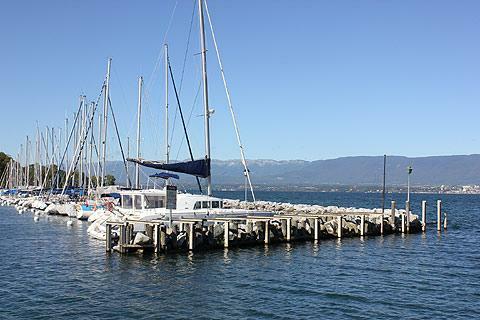 You can take a pleasant cruise across the lake from Yvoire. These take place in lovely steam boats and paddle steamers and visit a number of the attractive Swiss villages on the other side of the lake such as Vevey and Montreux. If you are looking to relax in the sun, the neighbouring village of Exceneveux has a large golden sandy beach. Nature lovers will enjoy a visit to the Domaine de Rovorée-La Chataignière, a 24 hectare park on the edge of Lac Leman with a selection of walks close to Yvoire. There is a group of chestnut trees here which are several hundred years old.